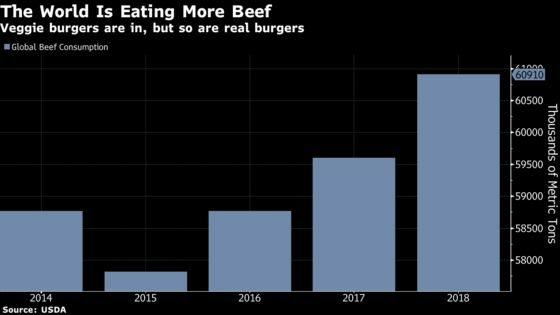 (Bloomberg) -- Americans can’t seem to get enough imitation meat and milk these days. Sales of substitutes to replace all types of animal products are up, and now comprise a $3.7 billion dollar market, according to data from Nielsen released Wednesday. The research was commissioned by The Good Food Institute, which represents the plant-based foods industry. For example, imitation meat made from plants increased 23 percent in the year through Aug. 11 to $684 million. 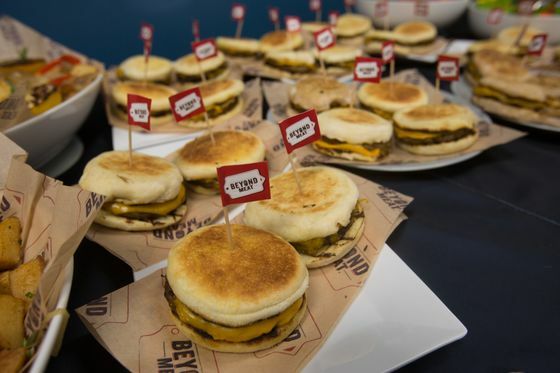 Silicon Valley’s Beyond Meat leads the pack with sales up 70 percent. About an eighth of all milk bought in stores isn’t from a cow, but rather from plants. Non-dairy yogurts, cheeses and ice cream are soaring, rising 40 percent and more. By comparison, retail food sales generally is growing at 2 percent. To be sure, soaring alternative proteins are still dwarfed by the $49 billion red meat and poultry market, and are unlikely to have any effect on traditional animal protein demand through the next decade, according to CoBank. About 95 percent of Americans eat meat, a number that hasn’t changed in decades, said Eric Mittenthal, a spokesman for the North American Meat Institute. “It’s flattering that plant-based companies have sought to imitate what nature has perfected,” he said.